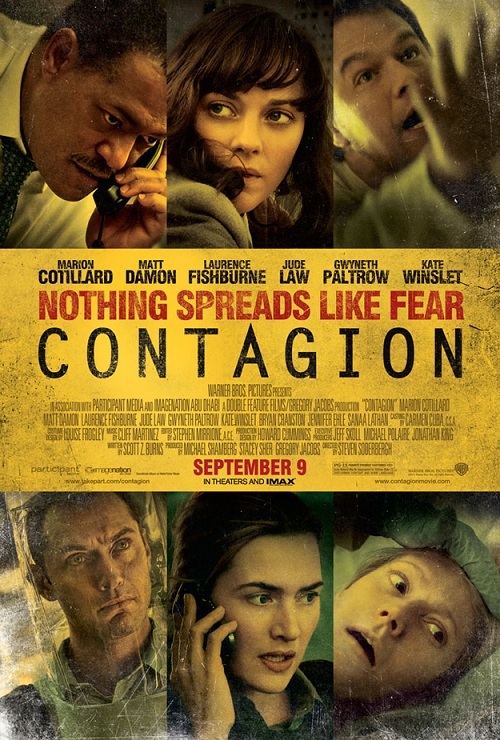 Contagion is essentially the Love Actually of disease thrillers. Seemingly disconnected narratives intersect to illustrate the world’s response to a new super-virus with a devastating severity that is beyond any other health crisis of our lifetime. For those of you not familiar with Love Actually, the similarities tend to end at the narrative’s structure and film’s elite cast. This is because twenty-seven million people don’t die in Love Actually. Nor does Gwyneth Paltrow get scalped. Explaining each narrative would detract from the film’s appeal. The premise of the film is that Gwyneth Paltrow gets sick in Kowloon, Hong Kong, returns to the USA – dies – and is the start of what becomes a seriously badass influenza pandemic. Laurence Fishburne takes control as Centre of Disease Control leader Dr Ellis Cheever, coordinating a group of international specialists to try and contain the seemingly apocalyptic situation. Key players include Kate Winslet, as fieldwork co-ordinator Dr Erin Mears, and WHO representative Dr Leonora Orantes (Marion Cotillard). The film also focuses on the human element of the crisis, namely via Matt Damon’s overprotective father duties and Jude Law’s painful attempt at being an obnoxious Australian blogger, who uses the crisis to launch his journalistic career. The separate narratives work well in the way that they can communicate the extremely broad scope that a health crisis has on all areas of society, and the consequences that seemingly small decisions can have on the safety of the entire world’s population. Most interesting is many of the powerful characters’ individual conflicts between their professional and personal ethics, which helps make the characters more believable and sympathetic. Having studied developmental politics, I would have liked to see a larger role of international organisations such as WHO and the UN, but I do appreciate director Steven Soderbergh’s choice to focus on the individuals, rather than political collectives. Subconsciously this may have been a satirical stab that international entities actually do very little during a health crisis, but perhaps I am over-analysing it. Instead, the heart of the film is at the medical solution to the pandemic, rather than the political. Therefore, the film rightfully makes heroes of the health workers struggling to cope with the magnitude of the situation, and does so without glamourising their position, as seen with many other health dramas. One criticism would be that the high-profile cast, while excellent in their roles, can be distracting at times. Almost everyone who speaks in the film is famous, so while you feel like you’re getting your money’s worth, you can’t help but try to place the characters in their previous works. Honourable mentions go to Malcolm in the Middle’s dad (Bryan Cranston), Ross and Monica’s dad in Friends (Elliott Gould), and Veronica Mars’ dad (Enrico Colantoni). However, the Oscar-winning actors (of which there are many) thankfully left their egos at home, as screen-time was shared equally. This makes it nearly impossible to name who is the film’s central character, which helps the audience to better follow the separate narratives more effectively. The scariest part of Contagion is that it could potentially happen. You can’t help but feel a little bit paranoid, especially when someone in the cinema coughs halfway through. From now on, I think I will take Kate Winslet’s advice and stop touching my face so much. Apparently it helps. Super looking forward to seeing Gwenyth Paltrow get scalped! Not every day do we get to see such a beautiful head of hair get the ultimate “treatment”. This entry was posted in Film and tagged contagion, ensemble cast, film, gwyneth paltrow, matt damon, Review. Bookmark the permalink.